Ashley Gibson crosses to score his first try. 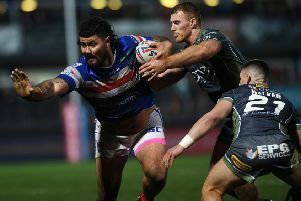 Winger Fetuli Talanoa scored four tries as Hull ended Wakefield Trinity Wildcats’ five-game winning run with a 46-28 victory at Belle Vue. In an end-to-end encounter, the visitors led 24-6 after 24 minutes and went 28-24 behind early in the second half, but dominated the final half an hour. Ashley Gibson scored a first-half hat-trick for Wakefield, including the opener after seven minutes. Hull responded through Gareth Ellis, Talanoa, Josh Bowden and Talanoa again and four conversions from Marc Sneyd seemed to put them in total command. But Wakefield rallied with three converted tries in an 11-minute spell before the interval, with Tom Johnstone going over and Gibson crossing twice. Finn converted all three, but missed a penalty after the half-time hooter had sounded. Wakefield regained the lead early in the second half when Danny Kirmond crossed, but this time Finn’s kick hit a post and that proved a key moment in the game. Hull went back in front when Talonoa completed his hat-trick and then Kirk Yeaman went over and Sneyd’s sixth goal made it 36-28. Wakefield were still in it at that stage, but Hull’s defence improved and the hosts’ attack went off the boil. Hull sealed victory six minutes from time when Talanoa crossed again - Sneyd failing to add the conversion for the only time - and there was still time for Jamie Shaul to touch down to complete a precious win.